It’s difficult to say whether the anticipation of labor is actually more frightening than labor itself. One of the best ways to soothe those anxieties is to take advantage of all the resources available to you. Labor is different for every woman, so learning about it from a variety of sources can help you get an idea of what to expect as well as how you’d like your labor to progress. Here are a few people and places that can help ease your mind about your upcoming delivery. Women who have already gone through the process of labor are a great source of information. Invite a few of your mommy friends over for dinner one night to talk about their birthing experiences. Ask them to avoid horror stories, but be clear in your desire for a realistic account of what they went through. Remember no two deliveries are just alike, but you can still get an idea of what to expect and what to avoid. Alternatively, prepare a list of questions and have your friends answer them. If a dinner party isn’t an option, send out a mass email or make a Facebook post. Forums for pregnant women and new mothers are a great way to reach out if you don’t know a lot of moms. Online advice also means you can ask your questions anonymously, while staying connected with other mothers who are going, or who have gone, through the process. Take a birth class with the essentials crammed into just a few weeks. You can even find classes that only last a couple of hours, although others may last for multiple sessions. 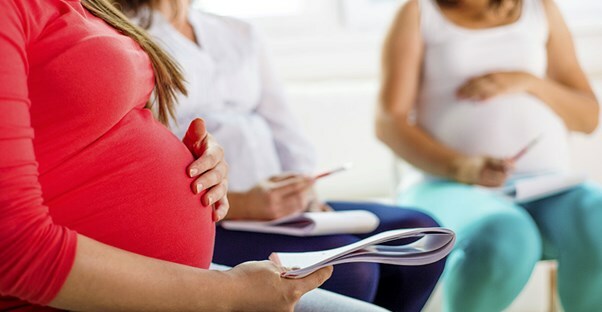 Check with the public education department of your local hospital, your local Lamaze chapter, or ask your doctor or midwife for recommendations. This is a great way to not only get information from an expert, but also to meet other expecting mothers -- many of whom have similar concerns. Take a tour of the labor and delivery ward at the hospital or birthing center you will deliver at. Seeing the rooms and equipment, meeting the caretakers and doctors, and just being in the environment can relieve a lot of the anxiety you may have. Ask logistical questions, like who is allowed to visit and when, if you will receive lactation consultant assistance after the baby is born, and if you can bring your own birthing equipment (like a birthing tub or stool). Make a list of questions to bring to your next appointment with your medical team. These people have gone through hundreds of births with all different types of women. This means they not only know the ideal way labor and delivery is supposed to go, but they’ve seen the how things actually happen in real life. Additionally, your doctor is familiar with your body and your baby, which means she can offer advice that is tailored specifically to your situation.